Today, in our hyper-cyber “one click away” market, shopping for our homes has changed, as well as designing them. We can “pin” and buy décor online, from mirrors to pillows, to ordering light fixtures and furniture, we are fortunate to live in an era where we can shop from our computers at home or as we sip a latte at our local café. But what about shopping for fabrics and wallpaper? It’s simply not the same. The reason; touch. This is especially important in the revival of wallpaper and wallcoverings in the world of interiors. For those who have fallen for the treasured texturized trend of designing with grasscloth as I have, this tactile experience is actually a treat. Sure, it means leaving your computer, spending a little more money, and physically engaging with different samples and colors, but it allows you to run your fingers along the weaved strands, examine the color variation, and appreciate its organic appeal. Grasscloth is an organic and sustainable fiber, that varies from mixes of Raw Jute, burlap, hemp, Sisal, reed, arrowroot, boodle, reed, cork, java/triangle grass, (and even silk), woven together using sea grass and thin cotton strands, and is then backed with thin rice paper. Although the process of making Grasscloth is long and tedious, it bridges the gap between nature and the indoor confines of one’s home. In fact, Grasscloth invites nature into the home, which is why many designers pair Grasscloth with materials such as bamboo and stone. Grasscloth is known for its Asian influence and naturally fresh ambience. It commonly used as wallpaper, wall coverings, and room partitions by high end designers including Tom Felichia and Burnham Design. Courtesy of our friends at Twenty2 Wallcoverings, this image shows how to order grasscloth with the click of a button! Twenty2 has every color and texture under the sun. As I learned through my research both in person and online, the best way to choose your Grasscloth is by having an actual sample in your hand. Listen up cyber-creatives! It is possible to order these samples online. However, granted that Grasscloth is expensive and comes in various shades and hues, it sometimes helps to contact an interior designer and visit a showroom or fabric studio. I chose to do both. I began searching on Houzz.com to get a feel for who the top selling grasscloth manufacturers were, and from there I found “similar” or “related” products which lead me to other websites and manufacturers. 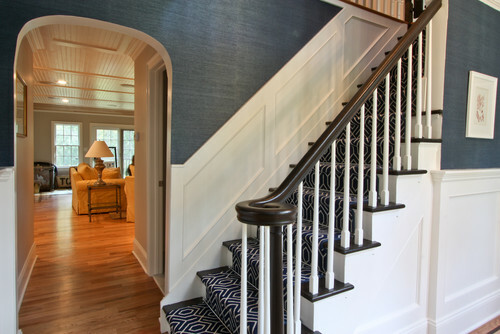 My journey began with BN Wallcoverings, Schooner Prints, Inc., Brewster, Twenty2 and more. I then made my way over to Ann at Urban Source Chicago, a walk-in design studio with an extensive collection of new, chic, and exciting fabrics, patterns, wallcoverings, and wallpaper samples displayed on racks to facilitate the design process, and allow for mix and matching. This still is a retail showroom, with employees dedicated to fostering creativity and providing design solutions, which is why I went back multiple times to get more samples and information! Anne walked me through their entire collection, provided me with information about the difference between the products, suggested Grasscloth providers and their sample books. Thanks to Anne, I discovered Aztek, Inc., Zoffany, Symphony, and both Kravet and Ronald Redding and many more Grasscloth Manufacturers. Another one of the main reasons why people need to have a Grasscloth Sample in their hands is because no two strands within the Grasscloth weave will ever be the same color. This fiber does come in vibrant colors (for those with an eclectic style), such as bright Yellows, Hot pinks, and other Metallic pallets shown to me at Urban Source. Many prefer a cool green, blue, navy, ultramarine, or Indigo to emulate that environmental aura. Another “trend” is to choose one of grasscloth’s multifarious neutral tones, including beige, brown, grey, cream, charcoal, silver, tan, etc. Why are interior designers currently enamored by these hues of Grasscloth? The main reason interior designers and homeowners gravitate towards these neutral tones is because they help bring out pattern and texture without taking away from the overall color or features of the room. Decoist.com refers to this as “understated texture” (Nothingham, “20 Living Rooms…*). Note: when searching through pallets, not all colors are named, and many have names quite more simple than “grey” or “blue.” On my “Grasscloth Journey” I found colors with Nuanced Titles, such as “Heron” (Twenty2), “Wisteria Blue” (Schooner Prints, Inc.), “Metal Black Dud Sisal” (Astek, Inc.), “Juan Grey” (Brewster). When you take home a sample of some of these Grasscloth colors, you will notice hits of other colors. Interesting enough, you might see a shimmer, or shine, or a reflection that has you ask yourself “What color is this again?” There are specifically Metallic collections sold (Astek, Inc.), making certain spaces appear more glamourous and stylish, especially with hints of silver or gold. The key to analyzing your samples and coming to a decision on which Grasscloth to use in designing a space is to use lighting (both natural and artificial) as much as you can. The lighting evokes the color and texture, and reawaken your senses. Often, I see people holding up their samples above their heads, squinting, and experiencing an “ah-ha” moment of clarity. It is also helpful to hang a grasscloth sample up on a wall for a few days, and try and imagine what the space would look like with that choice. This is definitely something I would recommend. The process is similar to picking out paint swatches; bring home paint chips and samples and compare. In fact, invite friends and family over, hang up each grasscloth sample on the wall within the space you are designing, and seek their opinions too! Yes, in design preference and aesthetic is relative to the viewer, but once they touch the grasscloth, they too can share in that sensory connection with the texture. Unlike standard wallpaper, Grasscloth varies in measurement and its sheets are much wider. Grasscloth is sold in double rolls and commonly per 8-yard roll. These double rolls measure out to be 36 inches wide by 24 feet long. BE SURE TO CHECK IF YOU ARE BEING CHARGED FOR A SINGLE ROLL OR A DOUBLE ROLL. Designing a home is costly, and so is Grasscloth. According to the findings on my “grasscloth journey,” the range in pricing for designer grasscloth can start at fifty dollars and reach three to four-hundred dollars. I would honestly say, reasonably, that it depends on how much grasscloth you plan on purchasing, but expect to pay about 200-250 dollars per single roll. Now, this is a pricy number, but if you are someone that appreciates value and quality, this is a “worth it” expense. If you are wondering why Grasscloth is so expensive, take a look at the the long and hard working process of picking strands, of mixing sea grass and cotton, followed by the various raw materials mentioned above. The intensity of such a process, the labor of hand weaving delicate natural plant fibers, not to mention the decrease in natural resources is worth the cost. Many eco-friendly and green products on the market tend to cost more, as do internationally imported resources. For more information on this process, check out TotalWallcovering.com’s Absolute Beginners Guide to Grasscloth. http://totalwallcovering.com/blog/the-absolute-beginners-guide-to-grasscloth-wallpaper/ . Be Gentle! This is a precarious and expensive material- if you can, I highly recommend employing a professional installer. Plan out the placement of your grasscloth on the wall and remember to center the panels. I recommend choosing a focal wall. REMOVE ANY NAILS, BOLTS, Etc. Clean and prime the walls, and be sure to use a special wallpaper primer or shellac. Grasscloth does not come with an adhesive backing. A Specialty wallpaper glue is most efficient. MANUALLY APPLY THE GLUE ONTO THE WALL, INSTEAD OF THE BACK OF THE GRASSCLOTH. Why? This is not like installing regular wallpaper, when you can wipe off access glue that got on the wallpaper during the process; with Grasscloth gluing, THE STAIN WILL REMAIN. Grasscloth expands when it is wet. This does not mean you should directly apply water to the grasscloth, rather, presoak the material. Seamless seams are easier and apply smoothly, so be sure Trim the edges of the grasscloth. All you need to do is use a razor and some type of straight edge, and cut an inch from the left side and the right side of each strip of Grasscloth. Avoid installing Grasscloth in places where there is a lot of potential “foot traffic” or activity- moving furniture around can increase the chance of damaging the grasscloth, as well as people rubbing up against it, or children “rough-housing.” Also avoid installing Grasscloth in bathrooms; not just because of humidity, sanitation and frequent stains, but also because the Grasscloth is too absorbent. Yes, Grasscloth can be cleaned, but not with the standard bathroom cleaner. Such products have way too much moisture. The best way to maintain the grasscloth and keep it clean is to lightly dust or vacuum the material. I know what you might be thinking: What about those people who don’t want the hassle? Those who don’t want to pay that much? Those who want an easier installation? And those who want a material less precarious? Yes, it exists! There are Thousands of Faux Grasscloth and Vinyl Grasscloth wallpaper and wallpaper coverings sold throughout the world. I briefly sought this option out during my “Grasscloth Journey.” These Vinyl options are usually sold by the roll or by the bolt at 27 inches wide, and sometimes somewhere between 52-54 inches wide. Houzz.com and Urban Source (Chicago) have an abundance of Vinyl Grasscloth. I found colorful and exciting options sold by Brewster, Schooner prints, Source One, as well as Seabrook Wallcoverings. No one says it better than luxury wallpaper designer, Erin Chlaghmo: “What I like to tell people is to imagine the grasscloth as the supporting actress on the stage,” she explains. “Grasscloth is not the “star” or the main focus of this space you are designing- but it brings out all of the architectural features of the room and your unique objects and furniture. The walls will give a feeling to the room, not draw your attention.” I couldn’t agree more with Erin. The supporting actor holds everyone together, just like the wallcoverings, and sets the scene.